Michael Cummings, D.Pod.M. (Dist), S.R.Ch., M.Ch.S. is a HCPC registered chiropodist / podiatrist who qualified from the Cardiff School of Chiropody in 1989. He has been working in Norfolk for nearly 30 years, both in the NHS and private sector. 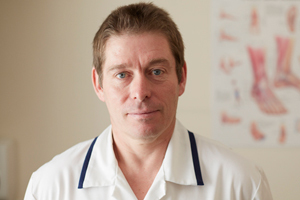 While in the NHS, Mike worked for a time at Norwich Community Hospital in the Biomechanics Department, with responsibility for Falls Prevention, including filming patients for digital video analysis. He has built up his two-surgery practice over the last 15 years and is proud of maintaining high clinical standards while giving the best personal experience to his patients. Mike’s experience means he can give comprehensive advice and gait training on both walking and running. “I get great job satisfaction from treating many varied foot and lower limb pathologies, often providing immediate relief. My speciality is dealing with biomechanical problems, which are caused by walking and running difficulties”. Born in Norfolk, Mike is an ex-rugby player, sprinter and long jumper. Now he is a keen tennis player with a love of sport. As both an ex-athlete and a lower limb biomechanics specialist, he possesses an intimate understanding of running / foot-related injuries. “Thornboy Statue ” awarded by Smith-Kline and Beecham and now proudly on display in the Sprowston Clinic. Appearances on Radio Norfolk, hosting footcare phone-ins.